To write an article like this one, which outlines the 'best' workouts for running distances ranging from 400 meters up to the marathon, is a somewhat dangerous activity. After all, workouts do not exist in a vacuum, independent of the other things you do during your training. The best workout for you to carry out tomorrow depends on both the quality and quantity of what you have done today, yesterday, over the last week and even during the previous few months. It depends also on what you need to accomplish during the rest of your overall training cycle—before your most important competition of the year. And it is certainly dependent on how far along you are in your training progression. If you have already developed tremendous general strength, for example, there is little need to keep hammering away with strength-building circuit sessions. If you have run 80 miles per week for many weeks, there is little need to continue with your efforts to 'milk mileage' for its fitness benefits; you'll gain more if you back down on the miles a bit and turn up the intensity dial on your training program. If you have just four weeks left before your major race and you have done no explosive training, you'll need to get started on that sort of work right away, and so on. Nonetheless, there are key workouts for each important race distance - sessions which have an unusually large impact on one's ability to run a particular race. These are workouts which in most cases should be carried out several times before an important competition, and many can be completed on a close-to-weekly basis before big races, with outstanding benefits resulting. Below, you'll find a list of these 'golden' workouts for five commonly run race distances, from 400 meters all the way up to the marathon. Remember that each workout requires a thorough warm-up before the intense work is attempted; bear in mind, that the workouts are not magical or all-encompassing - you'll still need to optimize your strength, power, VO2 max, lactate threshold and running economy using a smart training progression before you are ready to run your best race. Run 8 x 200 meters at your current 800-meter run pace, with just 10 meters of jog recovery between intervals. Used often by Kenya's great 800-meter man, Nixon Kiprotich (1:43:31 PR, Olympic silver medalist, two-time winner of the IAAF/Mobil Grand Prix, and number-one 800-meter runner in the world in 1993), this workout helps optimize 'speed endurance' - the ability to sustain a fast speed throughout the race. It also increases efficiency at 800-meter velocity, improves confidence, enhances your ability to come from behind during the race, and allows you to relax even while running powerfully. Alternate two minutes of close-to-max-speed running with 4-to-5 minutes of easy jogging until you have completed 5-to-6 of the 2-minute bursts. This session helps optimize lactate-threshold running speed, a key predictor of 800-meter performance (the 2-minute surges expose your leg muscles to high lactate levels, which over time dramatically enhance your muscles' ability to 'clear' lactate and utilize it as high-octane fuel). The workout also upgrades neuromuscular efficiency at the 800-meter pace, encourages mental toughness and heightens VO2 max, another key performance predictor. Run 200 meters all-out, followed by 400 meters at close-to-race pace with no break in between (200-400). Jog easily for three minutes to recover, and then repeat four to six more times (thus, 5-7 x 200-400). This workout dramatically improves lactate threshold and the ability to sustain an intense velocity throughout the full 800-meter distance. If you don't know your 3-K pace, it is about 7.5 seconds per 400 meters slower than your 800-meter race tempo. This workout upgrades speed stamina and helps promote VO2 max, lactate threshold and running economy. Run 2 x (4 x 1000), i.e., complete two sets, with four 1000-meter intervals per set. Take two minutes of rest between 1000-meter reps and 10 minutes between sets. The key to this workout is to run the first 800 meters of each 1000-meter rep at slower than race pace and the final 200 meters at or slightly faster than race pace. Used with great success by Nixon Kiprotich, this session helps you avoid fade-outs toward the ends of your 800-meter races, or - to put it another way - makes you the kind of 800-meter runner who powers past other competitors in the closing stages of the race. Yes, Herb was much more of a 1500-meter and mile man, but many of his workouts can be adapted readily for longer-distance preparations. This one's perfect for 10-K competitors. To carry it out, run 3 x 800 at 5-K pace, with two-minute recoveries, scoot 2 x 800 at 10-K pace, with 2-minute recoveries and then ramble 3200 meters at 10-K velocity without stopping. This session, in which you run about half of a 5K and half of a 10K at the relevant paces, improves your efficiency and confidence at 10-K speed, while also heightening lactate threshold, speed stamina and max aerobic capacity. On 6 August, 1958 Herb Elliot set the world record of 3 mins 54.5 seconds for the mile and broke the 1500-meter world record the same year. He only ever lost one race over 1500 meters or the mile and during his career he broke the 4-minute mile on 17 occasions. field works best (the grass is great for high-speed sprinting and the field erases the difficulties associated with estimating 100 yards on the track); simply accelerate dramatically over the first 20 yards of each rep, hold close-to-top speed for 60 yards, and then decelerate for 20 yards, stopping at the 100-yard mark. One of the toughest aspects of this workout is that you can rest (by jogging lightly in place) for no more than two to three seconds before reversing your direction and covering 100 yards the other way. 'Greyhounds' improve your stride length and stride rate (i.e. your power), and they also improve lactate threshold, as well as running economy at high speed. Named after the French scientist (Veronique Billat) who developed the rationale and protocol for this workout, the session involves running 5 x 3 minutes at your velocity at VO2 max (i.e., VO2 max), with 3-minute recoveries. What exactly is your VO2 max? To find it, simply run—on a day when you're feeling great—as far as you can on the track in six minutes. During your 3-minute Billat intervals, you will simply run half as far as you did during this 6-minute test. The 'Billat' spikes VO2 max, lactate threshold and running economy simultaneously, a terrific trifecta of benefits. It doesn't hurt that the workout also makes your 10-K pace feel like a Sunday afternoon rock in a reclining chair. This workout should be carried out approximately once weekly during the last six weeks leading up to a big 10K. Run 3 x (200-600-1600), with 3-to-4-minute recoveries between sets. The 200 should be run almost all-out, the 600 slightly slower and the 1600 at about 10-K pace. And oh yes - you should take no recovery between the 200 and 600, nor between the 600 and 1600! This incredible workout aggrandizes your ability to run at 10-K speed with enough hydrogen ions in your muscles to lower the pH of the North Sea. It also improves your running speed, your intramuscular buffering systems, your lactate clearance, your lactate threshold, your running economy and - probably - your VO2 max. Simply run a 5-K race! Running a 5-K race means you'll run half the 10-K distance at a pace which is about 16 seconds per mile faster than your current 10-K speed. Thus, running a 5K is a great way to develop the ability to run continuously at a velocity which is significantly faster than your current 10-K pace; each 5K is in effect a 'stepping stone' to a faster 10K. As your efficiency at 5-K speed improves, you'll be able to run longer distances at current 5-K tempo; eventually, you should be able to run your 10Ks at your current 5-K speed (of course, when that happens your 5Ks will be considerably faster). It doesn't hurt that 5-K racing is also good for VO2max and lactate threshold. Find a trail or road that climbs (i.e. increases in elevation) slowly but steadily for a distance of about 12 kilometers, and run from bottom to top at a hard intensity - without stopping. Such running routes are relatively easy to find in Kenya, but if you are an environmentally challenged marathon runner, you may have to complete this workout on a treadmill, varying the inclination from 2.5 to 5 percent as you run. Named after famed and world-record-holding Kenyan marathoner Tegla Loroupe, this session improves running-specific strength and upgrades your ability to sustain a sub maximal yet tough pace for a prolonged period of time (i.e. run a marathon). Like many people from her Kenyan homeland, Loroupe took up running simply as a means of transportation to and from school - a distance of six miles each way. She also ran up to 12 miles a day to herd cattle on her family farm. Loroupe burst onto the international scene in 1994, winning her New York City marathon debut and becoming the first African woman to win a major marathon. In September 1999, she clocked 2:20:43 at the Berlin Marathon, breaking by four seconds the women's marathon world record she had set in Rotterdam (The Netherlands) 16 months earlier. Run 10 miles easily, at a pace about 45 seconds per mile slower than goal marathon tempo, and then - without stopping - click off 10 more miles at goal marathon speed, before cooling down with two easy miles. This workout, which involves attempting to run at goal race velocity when you are already tired, is a diagnostic one; it will reveal whether your chosen goal is too lofty or too humble. It is also great preparation for the marathon itself, since it forces you to reel off 10 goal-speed miles when your legs are already a bit shaky. Finally, it improves confidence and efficiency at hoped-for marathon intensity, though don't forget to build up gradually to this 'simulator,' first using a workout which contains four easy miles and four pace miles, then graduating to six easy miles and six on-target ones, etc. Train easily for a week after you complete the 'simulator,' and make sure you do NOT carry out this session during the 4-week 'window' before your big day; otherwise, you won't be completely recovered in time for your best-possible marathon performance. After a thorough warm-up, complete the following routines in order. Move steadily from exercise to exercise without resting, but don't rush or let your muscles get tight. Repeat steps 2-13 twice more (for three circuits in all), and then cool down with two miles of easy running. These circuits build a tremendous foundation of whole-body strength and fatigue resistance, both of which are critically important for marathon running. The circuits also improve efficiency while running at marathon intensity and help to raise lactate threshold. Finally, the marathon circuits enhance your ability to run at goal marathon tempo when you are tired, and they are a tremendous confidence-builder. Even though this session is completed at a pace which is about 80 seconds per mile faster than goal marathon speed, it is a crucial part of marathon preparation because of its ability to simultaneously optimize VO2max, lactate threshold, and running economy, the three strongest physiological predictors of marathon performance. Ultimately, the 'Billat' also improves your power (i.e. shortens your footstrike times and slightly expands your stride lengths), and power boosts are great for both the miler and the marathoner, even though many runners think of the marathon as a non-power event. For example, if the 3:06 marathoner decreases footstrike time by just 10 milliseconds (without altering stride length), race time will improve by more than six minutes, moving the marathoner into the highly desired sub-3-hour category.
. Don't take any recovery between the intervals within the set, but do recover (with easy jogging) for four minutes between sets. This outstanding workout makes marathon pace feel easier, increases your confidence that you can run at marathon speed while fatigued, and is also good for VO2 max, lactate threshold and running economy. Named after coach Frank Horwill who used this workout as a 'cornerstone' in the training of five different sub-4-minute milers, this session involves running 2 x (3 x 200) at your best-possible 400-meter speed. In 1965 Frank Horwill coached his first UK indoors record-breaker at 800 meters and was to repeat this in 1966 with the women's 1500 meters. In 1971 one of his female athletes ran a world's best 3km time indoors. In the course of five years, his athletes broke five UK indoor records. Five of his athletes have run sub-4 minute miles - the fastest being Tim Hutchings, who ran 3:54:53. 400-meter speed is about eight seconds per 400 (and four seconds per 200) faster than 1-mile race speed. Take 2-minute rests between the 200s within the set and a 5-minute recovery between sets. Completing this workout is an important step toward developing greater speed during 1-mile racing; individuals who carry out this workout about once every 10 days become more efficient and relaxed at speeds faster than 1-mile pace - and ultimately 'graduate' to higher velocities in their 1-mile races. Named for the same coach, this workout consists of 2 x (2 x 1600 meters) at about 3-K race pace, which is roughly 16 seconds per mile slower than 1-mile race tempo. Horwill liked starting out with a 4-minute rest between reps and an 8-minute rest between sets (but his runners gradually progressed to one minute between reps and just five minutes between sets! ), and he also liked to tack on four 100-meter strides at close to full-out velocity, with short recoveries at the end of the session - just to remind the leg muscles not to forget about running at race speeds and faster. This challenging session approaches mile fitness from the 'endurance side' of things, forcing users to repeatedly hold a quality - although not quite 1-mile - intensity for a little longer than the time duration of a 1-mile race. The workout builds speed, stamina and also heightens VO2 max, lactate threshold and running economy. 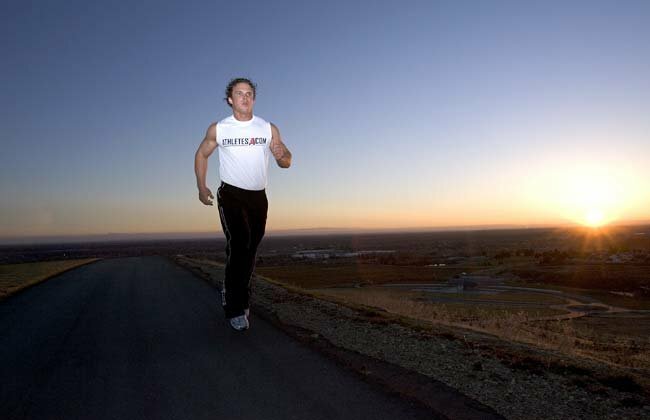 Herb's superb workouts can be used for a variety of different race distances. In this one, you simply alternate top-speed 45-second sprints with 3-minute jogs for a total of about 40 minutes. This workout is great for developing greater speed and a heightened ability to run fast while tired - without overly traumatizing the legs. It also has a dramatic impact on lactate threshold, because leg muscles are exposed to - and forced to utilize - the mega-levels of lactate generated during the 45-second sprints (they break down a lot of the lactate during the intervening 3-minute 'floats'). Just run (8 to 10) x 400 meters at your goal 1-mile pace, which should be no more than four seconds per 400 faster than your current 1-mile race speed. Start with 3-minute recoveries, and try to pare down recovery duration over time. Milers have traditionally trained in this fashion, primarily because this session is excellent for developing power and efficiency at goal race speed. It's nice to know that it is also good for VO2 max and lactate threshold, especially as the recovery intervals shorten. Simply enter and compete as well as you can in an 8-K race every 4-to-6 weeks. While this might sound strange, 8-K races are terrific for milers because they are completed at an intensity which is well above lactate-threshold speed and thus generate sizable amounts of lactate, exposure to which will eventually help the miler optimize lactate threshold, a key predictor of 1-mile performance. In addition, 8-K racing improves speed-stamina and VO2 max. Yes, a 5-K race would also be beneficial, but running an 8K prolongs the 'workout' without sacrificing too much in pace and may ultimately lead to greater gains in fitness. Run about 50 meters all-out (as fast as you can), slow down just slightly for 100 meters, and then cover 150 meters at your 400-meter race pace. That's one super set, and you can complete four more such sets before your workout is through, with a 5-minute recovery between sets. This 'super' workout improves max running speed and enhances your ability to run at 400-meter pace in the face of mounting fatigue and fast-dropping muscle pH. Run 8 x 200 at your 400-meter race speed, with recovery duration increasing over the course of the workout. Start with just a 1-minute recovery after the first 200 and gradually move up to 5-minute recoveries as the workout progresses (expanding recovery duration increases the chances that the last 200 will be run as fast as the first). This session ameliorates efficiency and confidence at race pace. Run 4 x 600 meters all-out, with 10-minute recoveries after the first three 600s. This workout enhances your ability to sustain a hard pace over the full 400 meters of your race. During the workout, pay special attention to staying relaxed yet powerful over the final 200 meters of the 600; don't let your form break down. Hop as quickly as you can for 25 meters on your right foot, emphasizing quick contacts with the ground and forceful forward 'explosions' each time your foot hits terra firma. Without stopping or resting, hop 25 more meters in a similar manner on your left foot. Again without interruption, resume sprint-hopping on your right foot for 25 meters, closing out the rep with 25 meters on your left foot. Rest with 2 minutes of light jogging, and repeat five more times. This workout improves coordination, as well as the rate and quantity of force production (i.e. power) in each leg. Ultimately, as your power improves you will run your 400-meter races more quickly.